This is not the second amendment. My junior year of high school, I took an introduction to engineering course. My school received funding from the state for STEM courses such as engineering and robotics. I still remember walking to the basement of my school to see my teacher printing something out of the 3D printer, and it always amazed me to see how far technology has advanced. 3D printing has changed our way of living. In the news, there are stories of how this technology is being used to print organs for transplant patients and help lead the world to more advanced medical practices. For transplant patients, the list keeps growing where priority matters in your situation. Sometimes people end up waiting for months to hear back for a heart or liver, and it really is a matter of life and death. Even on ABC's hit show, "Grey's Anatomy," they have adapted the practice into the show. It's 2018. The world around us is gaining so many advances thanks to technology. However, there is a dark side to ongoing phenomena. Over the past couple of days, news has broken out about Cody Wilson releasing blueprints for a fully functioning 3D gun. However, this isn't a new creation by Wilson. In 2013, a video surfaced of Cody Wilson at a shooting range in Texas with the first gun he had created. He then saw the popularity his video got and decided to release his blueprints to the world. It took until there were approximately 100,000 downloads for Wilson to be sued by the federal government in 2015. For whatever reason, Wilson reached a settlement in his case back in June and people were able to begin re-downloading this dangerous item. In numerous interviews, Wilson said he had found a solution for gun reform in letting people download and protect themselves by building their own gun. It is the exact opposite of public safety and just putting the public at risk. Even though it is plastic, it still shoots and acts like a gun. It took until Tuesday night, less than 24 hours before the blueprints were meant to go live, for a federal judge to rule it was illegal to post the blueprints in the first place. Thankfully, Wilson's website has been shut down to prevent anyone else from reaching these downloads. However, the blueprints are still out there. Theoretically, anyone who has the blueprints to build a handgun or even an AR-15 can potentially do so. This is not the second amendment. I am not the first one to raise concern over the growing number of deadly shootings in America, and whether Cody Wilson wants to disagree, this is not helping to protect the public. There is a fight for gun regulations and disablement of the NRA for a reason, so this epidemic can decrease. I firmly believe that there needs to be stronger screenings for who wants to obtain a gun through psychological evaluations and training courses with law enforcement. All it takes is these blueprints getting into the wrong hands. These are ten of the most savage attacks on American innocence. School shootings in America trace back as early as the Settlers and Indians . Over the years, attacks on schools have gotten progressively more brutal, senseless and deadly. Motives behind such occurrences are often blamed on social cliques and bullying or the perpetrators often suffer from mental illnesses or addiction. 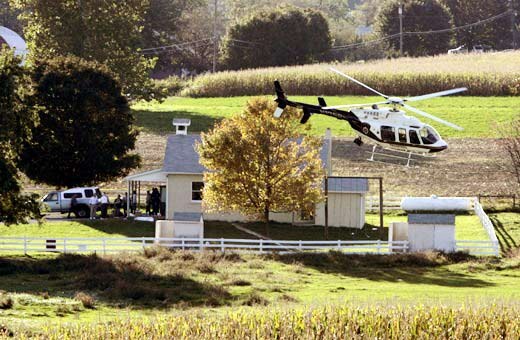 On October 2, 2006, milk-tank truck driver Charles Carl Roberts opened fire on a small Amish schoolhouse in Bart Township, Pennsylvania. Prior to going to the school, Roberts left a suicide note at home for his wife and children. Roberts entered the one-room schoolhouse and ordered all the boys to leave, as well as one pregnant woman and three parents with infants. He ordered the remaining ten girls against the wall and held them hostage. Sisters Mariah and Barbara Fisher, ages 13 and 11, courageously asked to be shot first in exchange for the lives of the other young girls; some were as young as six years old. Roberts killed Mariah and wounded Barbara. In addition, he shot eight out of the 10 girls, killing five of them. 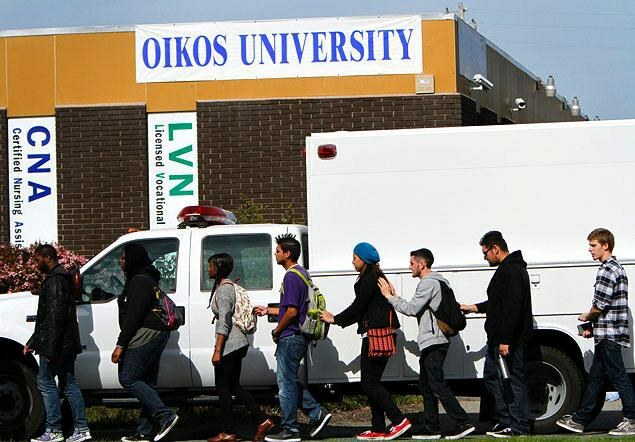 43-year-old One L. Goh committed Oakland, California's deadliest mass killing on April 2, 2012, at the Korean Christian college Oikos University. Witnesses testify Goh stood up in his nursing class and ordered everyone against the wall at gun point. One student recalls him yelling, "Get in line..I'm going to kill you all!" before firing. He killed seven people and wounded three others. 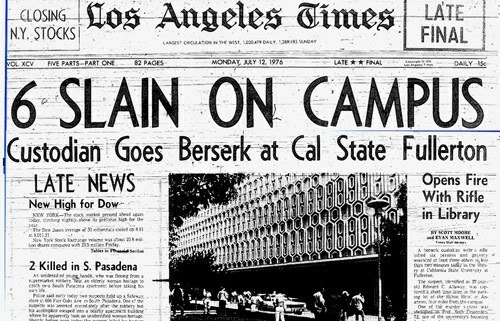 Custodian Edward Charles Allaway was reported as going "postal" on July 12, 1976 at California State University in Fullerton, California. The 37-year-old employee of the institute had a history of violence and mental illness, and was later diagnosed as a paranoid schizophrenic. He was found insane by the judge of his trial for the murders. He called the police after killing seven people and wounding two others, and turned himself in. His motives behind the mass murder included him believing the university library was screening pornographic movies his wife was forced to appear in. He is currently receiving medical treatment for his condition at the Patton State Hospital. 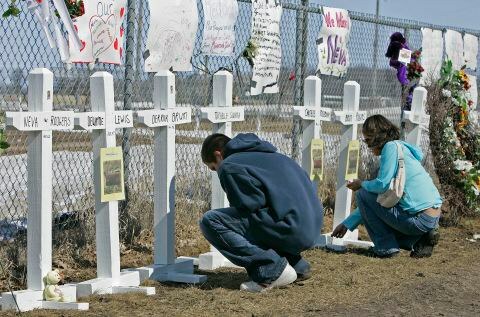 The Red Lake Indian Reservation in Red Lake, Minnesota will never quite be the same after events which occurred at the senior high school on March 21, 2005. 16-year-old Jeffrey Weise killed his grandfather (a tribal police officer) and his girlfriend. He then robbed his grandfather of police weapons and bullet proof vest, before ultimately driving to Red Lake Senior High School where he killed seven people and wounded five others. Weise took a total of 10 lives that day, including himself. He committed suicide in a classroom after exchanging fire with police. Witnesses reported Weise smiled while shooting his victims and questioned multiple students about their faith before firing. On October 1, 2015, 26-year-old Christopher Harper-Mercer committed the deadliest mass shooting in Oregon history. 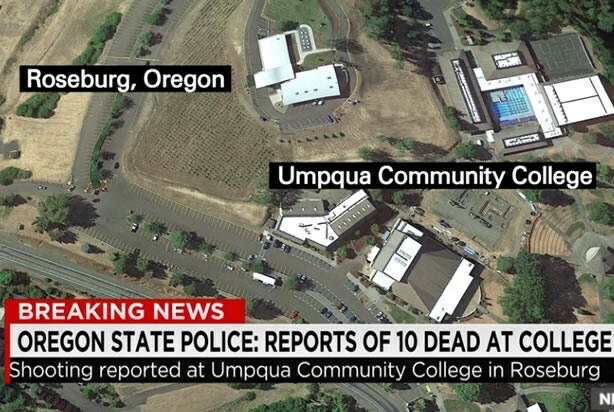 He killed nine people and injured seven others at Umpqua Community College in Roseburg, Oregon. He spared one person in the classroom he opened fire in, only to deliver a message to the police for him. Mercer was described as "hate filled" by those who knew him. In addition, he identified himself as a White Supremacist, anti religious and suffered from long term mental health issues. Some theories behind the mass shooting were Mercer falling below a C average, putting him at risk for suspension, as well as him not being able to pay the tuition bill due. He ultimately committed suicide after the attack. The Enoch Brown School Massacre is one of the first documented school shootings in U.S. history. 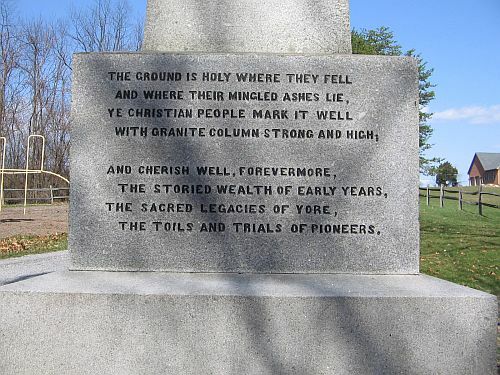 On July 26, 1794, four Lenape Indians entered a Settler's schoolhouse in Delaware where they massacred school master Enoch Brown and nine children; they were shot and scalped. Two children survived the attack and four others were kidnapped and taken as prisoners. This event is considered one of the most notorious incidents of the Pontiac War. 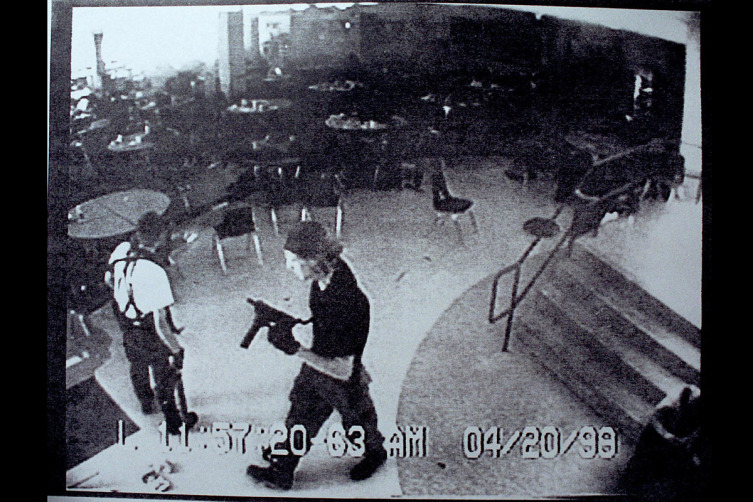 High school seniors Eric Harris, 18, and Dylan Klebold, 17, may have not committed the deadliest school shooting in the U.S., but their killing spree at Columbine High School in Littleton, Colorado is considered one of the most infamous attacks in history. It sparked numerous debates, including gun control, anti-depressant drugs and the influence social cliques, violent video games and bullying have on the mental health of high school students. Harris and Klebold spent countless hours preparing for the events on April 20, 1999, which were documented in their "Basement Tapes." The tapes contained footage of the two boys having target practice with illegally obtained firearms, as well as a suicide message and apology to their parents. Their ultimate goal was to be responsible for more victims than the Oklahoma City bombing, an event the boys idolized. The morning of the shootings, Harris and Klebold encountered one of their few friends Brooks Brown in the school parking lot. Brown was one of the few students the shooters considered a friend; they told him to leave campus immediately because "something bad was about to happen." Reports claim the boys targeted jocks, taunted people for their belief in Christianity and made jokes with each other while they killed their peers. Harris and Klebold took the lives of 13 people and injured 24. They committed suicide in the library together. 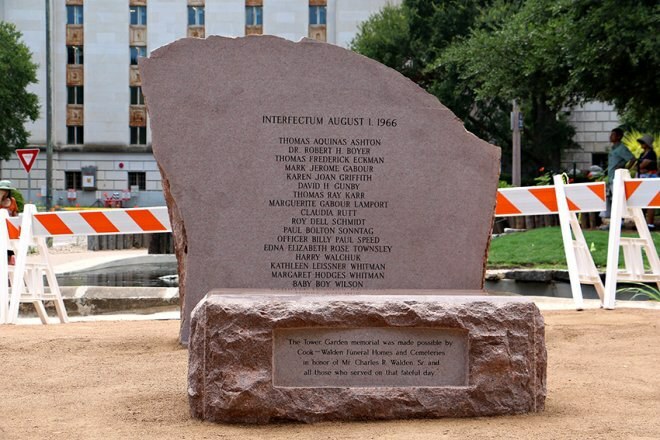 On August 1, 1966, former Marine sharp-shooter Charles Whitman unleashed havoc on the campus of University of Texas in Austin, Texas. Whitman positioned himself on the observation deck at the very top of the U.T. Tower; it was the perfect place for a sniper to have his pick of targets, considering you could see the entire campus from his vantage point. He killed 14 people and wounded 31 others. Prior to his attack on campus, Whitman killed his wife and mother. Post autopsy, it was theorized that Whitman's behavior might have been caused by a tumor found in his brain. Doctors and psychologists attribute the tumor to his impulsive, irrational behavior and his lack of a conscience. This theory was supported by records of Whitman seeking professional help prior to the shooting for "overwhelming, violent impulses" he felt he couldn't control. 20-year-old Adam Peter Lanza is responsible for arguably the most senseless and brutal attack on a school in U.S. history. On December 14, 2012 Lanza shook the town of Newtown, Connecticut when he attacked Sandy Hook Elementary School. Lanza killed his mother, before entering the school where he killed 26 people and inured two others; the majority of his victims were children aging from five to 10 years old. He committed suicide upon completion of the attack. This shooting in particular confused both the media and authorities, because Lanza never offered a motive or reasoning behind the murder of his mother nor the horrendous mass slaying of innocent children. 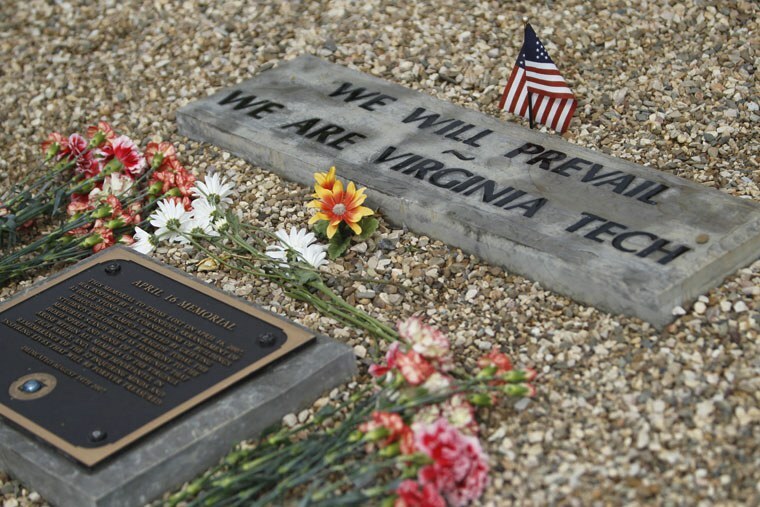 Virginia Polytechnic Institute and State University in Blacksburg, Virginia came under attack on April 16, 2007. Senior student Seung-Hui Cho killed 32 people and injured 17 more in two attacks – one in a co-ed dormitory, the other in the Engineering, Science and Mechanics building. He is noted as committing the deadliest attack on a school in U.S. history. Cho was previously diagnosed with severe anxiety disorder; among the tapes he personally mailed to NBC news, Cho expressed his hatred for the wealthy, compared himself to Jesus Christ and explained that he was forced to commit the mass shooting due to voices in his head. Virginia Tech has held the number one spot as deadliest school shooting for five years. Holocaust survivor Liviu Librescu was a professor in the Engineering, Science and Mechanics department at the school, who was famously remembered for using his body as a barricade against the door during the attack; Librescu was killed during the attack but managed to hold the door closed long enough for all of his students to escape out the window. Cho ultimately committed suicide following the shooting. There are three more people dead this week, lost to the pandemic of mass shootings and domestic terrorism. Jeremy Richman, 49 years old. Sydney Aiello, 19. Calvin Desir, 16. What mass shooting? I can hear you asking. When? Why I haven't I heard about it? You probably did hear about it. We lost Jeremy Richman to the Sandy Hook Massacre in 2012. Both Sydney Aiello and Calvin Desir, to the Marjory Stoneman Douglas massacre on Valentine's Day of 2018. The first anniversary for the latter has just passed, while the 5th anniversary of the Sandy Hook shooting was December 14th. All three survived these shootings. All three took their own lives. This is a painful reminder that death doesn't stop when the shooting has stopped. 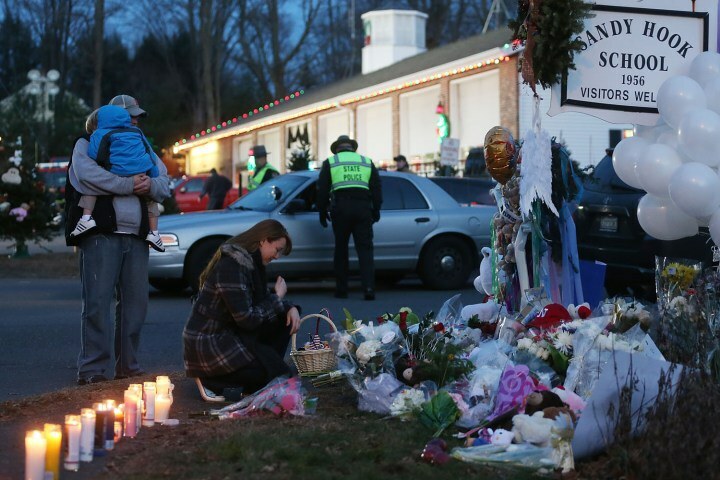 Jeremy Richman lost his 6-year-old daughter, Avielle, in the Sandy Hook massacre of 2014. Afterward, he started his own foundation and told Anderson Cooper that he was simply doing his best to get out of bed every morning. He was a neuroscientist, who strove to understand why such violent behavior occurs in the first place. Of his daughter's death, he said," It's such a shock to the system, that you just feel displaced like the world is spinning and you are not and you are just going to get thrown off of it. We came to the idea that we were going to create a foundation in her honor." He strove for justice and reason in a world that took the most precious thing from him. It has been six and a half years, but the trauma never leaves you. Even though Jeremy was apparently functioning in his day to day life, the recent autopsy confirmed his death a suicide. Sydney Aiello recently graduated from high school. She was diagnosed with post-traumatic stress disorder as well as survivors guilt. On her twitter, she expressed empathy for people like Robin Williams and Anthony Bourdain, who seemed cheerful before their suicides. She was going to go into the medical field, liked yoga, cheerleading, and brightening people's days, according to her family's Gofundme account. Her mother said that she was struggling in college, because classrooms now scared her, only reminding her of the incident. She lost her close friend, Meadow Pollack in the shooting. Meadow's brother, Hunter, tweeted his agony about losing Sydney as well. Her bright smile and bubbly personality will certainly be missed. Within a week of Sydney's death, Calvin Desir, 16, killed himself. He too was described as a wonderful person, who wouldn't hurt a fly, described by his family as soft-spoken, selfless, and someone who would never hurt a fly. He enjoyed riding his bike, cooking, trying new recipes, and spending time with his sisters. A year, six and a half years later, 10 years. The pain will never go away. Experts say that in mass killings like these, "particularly in schools, where we expect to be safe, the incidence of PTSD afterward can be very high." Primarily because the location is one where students, faculty and parents alike expect safety to be found. If nothing can or will be done to prevent tragedies like these, before they happen, put energy into giving the survivors proper mental health care. Especially as we face more and more people who will be dealing with the aftermath of such events. Remember the risk factors, anniversaries, illnesses, life transitions, birthdays, things that may make them feel guilty for living while others don't. Memorize the signs of survivors guilt, PTSD and of suicide. If you can, donate money to a research or prevention fund, like those that can be found here. Most importantly, remember to be kind and warm, like the three we lost were. Make the world a kinder place than the one they left. Sydney, Jeremy, and Calvin will be missed dearly, by both those who knew them and those who didn't. Rest in peace. If God Is Real, Why Did The Parkland Shooting Happen?